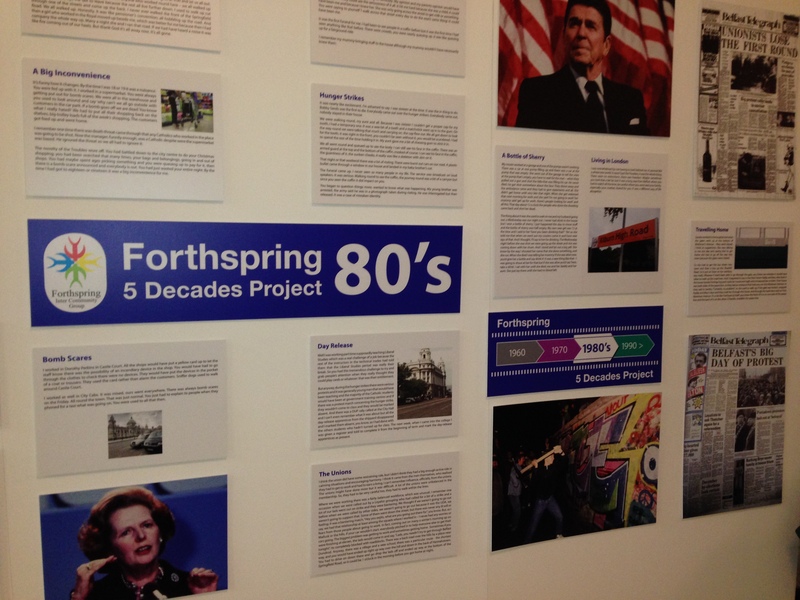 I saw this picture at the Forthspring 5 Decades Exhibition showing in the City Hall, Belfast. It is thought-provoking, punchy and heart-rending. I was reminded of pictures I had seen in Rwanda and of people I had met. So many people determined that what happened in Rwanda in 1994 would not happen again. 10 people were killed every minute. 10 000 people were killed every day. Over 1 million people were killed in 100 days. Staggering. Ethnic division and demonisation preparing the way for extermination. 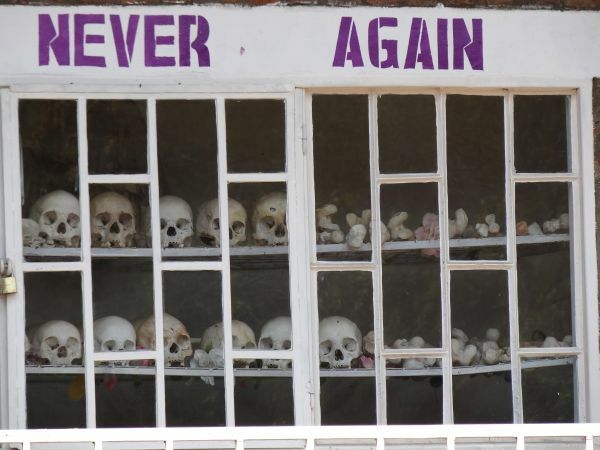 In a recent Panel Discussion held by the United Nations to Mark 20 years after the Rwandan Genocide, the Deputy Secretary General of the UN, Jan Eliasson, said that when we continue to speak of ‘never again’ we are expressing continuing failure. I think I would prefer to say that we are admitting we have not yet got it right and there is much work to be done. So how might we know that we have not yet got it right? Beyond the continuing need to speak of ‘never again’ how might we know? 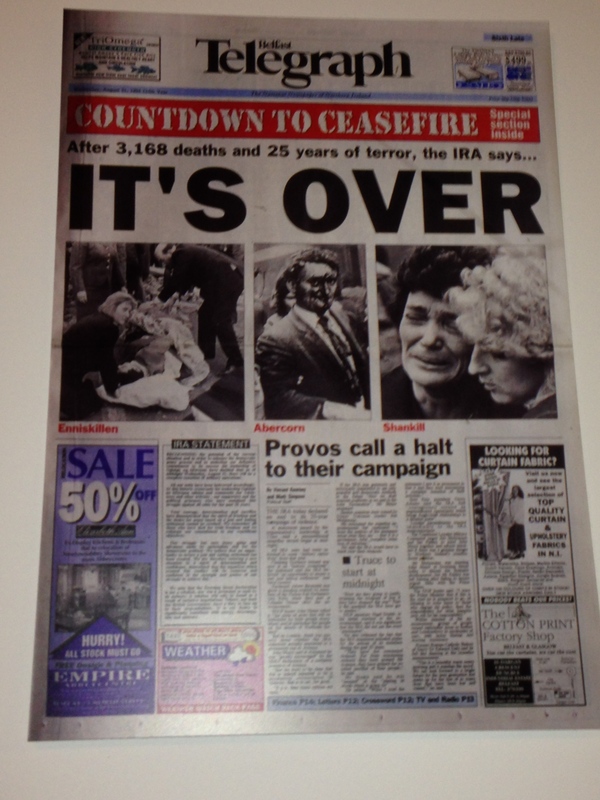 All of this got me thinking about our situation in Northern Ireland. We spend so much time thinking about young people but do we take it seriously when we hear that paramilitary groupings are recruiting young people? 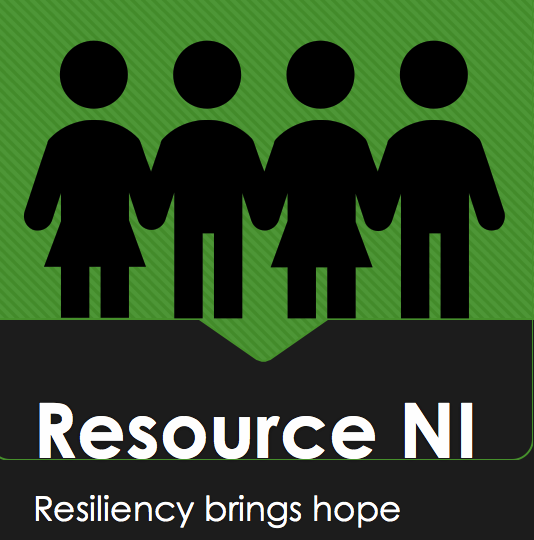 Do we take it seriously when we hear that young people who were moving away from being ‘at risk’ are being pulled back into the types of crime that will generate income for those paramilitary groupings? Do we take it seriously when children and young people are found in the vanguard of protests and violence? Or are we inclined to say that’s only to be expected in certain areas or certain communities? 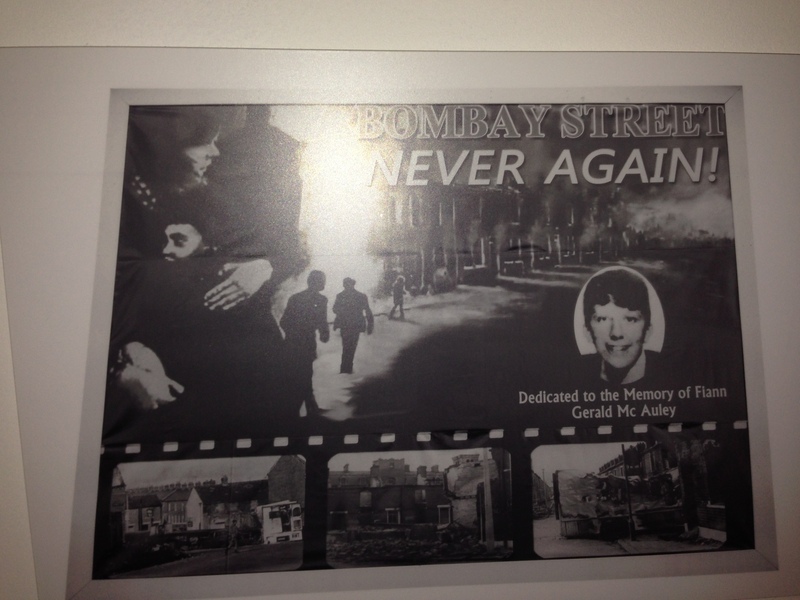 Never Again: what will it take? Lower than a snake’s belly in a tractor groove. It was one of those days for quotations. I was at the local shop and the woman behind the counter asked me how I was. On telling her I was fine she told me she’d been ‘lower than a snake’s belly in a tractor groove.’ Graphic. Raw. Visceral. It is a Belfast beautiful phrase from one of those wonderful Belfast people who tend to tell you how it is. I can say that. I’m not from Belfast. She went on to tell me what had made a difference to her when she was feeling low – the friends who sat with her and didn’t tell her there were those worse off than her. Street wisdom of the soundest kind. There’s a crack in everything – our lives, our communities, our cities, our town-lands. You name it and there’s a crack in it. When I was a child I used to try to miss stepping on the cracks in the pavement. There was something abominable about them. Cohen has more enlightenment. Without the cracks in our lives we close down and close in on ourselves. We pretend all is well when, in fact, we still need the light to get in. There is something in us, as storytellers and as listeners to stories, that demands the redemptive act, that demands that what falls at least be offered the chance to be restored. I had the privilege of being MC at the launch of the 4corners festival in Belfast. The theme is storytelling. It’s a big theme in Northern Ireland. We all want to tell our stories. We all want someone significant to listen. The Historical Abuse Inquiry has opened and there those who suffered will get the chance to speak, to tell their story, to someone in authority in the hope that it will make all the difference. O’Connor reminds us that we are all looking for redemption, healing, hope, a new beginning. As we tell our stories and as we are privileged to listen to the stories of others there is the persistent demand for the redemptive act, a persistent striving that what has fallen will at least be given the chance to be restored. That is hope, hope so ingrained that it gives everything that falls a chance to be restored. That is the redemptive act in the relationship between speaking and listening, storytelling and story hearing. Just another place where the light gets in. What do we have to lose by letting the Haass-O’Sullivan Document sit? It was always going to be difficult. Outstanding issues from our troubled past, together with the issues of parades, protests and flags, have been sitting in the political wings while across society people worked around them to build a stronger community. But in the sitting they have become a burden and that was why the First and Deputy First Ministers invited Richard Haass and Meghan O’Sullivan to facilitate a process amongst the panel of parties. I, probably like most others, found myself both hoping that something would come of it and despairing if we would ever find our way through it. At first I thought the past would be the most challenging of all three areas. Parades and flags are symptoms of a deeper problem and often treating symptoms is much easier than treating cause. As it became clear there was an impasse on the flags issue I became more hopeful that the cause would be dealt with and for a while it seemed that would be possible. All the parties have now taken a position on the paper and I find myself similarly hopeful and despairing. I don’t want to give up yet. I don’t think it would be good to give up yet. So what would we lose if the process is stalled for a while? The process is part of the Together Building United Community strategy which itself builds on the Shared Future and Cohesion, Sharing and Integration strategies. The fact that a shared future strategy has had to morph three times already would suggest that it hasn’t sat easily into the divisions that persist. The first loss, then, is to the ambition of a more shared, united community, built on the pillars of equality, human rights, parity of esteem and normalisation. None of this is easy to navigate in the context of concrete issues and yet without a commitment to resolution we lose the momentum towards a new society that constructs new dynamics and relationships which resist the recurrence of the Troubles. There are those who complain that the police and the army are too much in the dock these days. Inquiries run against them, there is a momentum for careful scrutiny of the past and the result is a daily reliving of the past. Those who complain want all of this to stop. Their voices are heard alongside the voices of those who believe uncovering the truth of the past is essential. Whether that be in an examination of the various narratives of the past, or in the search for justice and truth, there is a desire for the things of the past to become known. Both of these groups of people find themselves frustrated by the Haass-O’Sullivan process. Neither of them will get their desire. On the one hand, there is no alternative mechanism to deal with the leakage of scrutiny into our everyday lives. On the other hand, there is no means of examining what happened in the past so that narratives can be seen and heard and given thought. The loss, then, is across the board. Add to that the difficulties units for dealing with outstanding cases are facing – HET & PONI. Complaints come from across the community about the lack of focus and resources, the lack of outcomes and the way in which the tasks are carried forward, together with concern about investigative powers, or lack of them. Justice is slow, if at all. Truth is hidden and there seems little willingness to reveal it. International standards relating to justice and truth demand more than this, as do those whose expressed need is to see justice being done, or to hear truth spoken, or both. Investigators and examiners of the unresolved cases can hardly feel good about themselves. Those who are seeking some reparation through truth and justice face the loss of a process which will deliver something. Inevitably no process can deliver everything to everyone but unless investigations and opportunities for truth recovery are provided then there is a loss of reparation. The Parades Commission has probably always been contentious. From the days of the North Report it was a tip-toe exercise to craft a process that would address the competing rights and identities involved in parading and protesting. There have now been three opportunities to redesign the Parades Commission and this third attempt has not made it over the line either, at least not as yet. Three attempts is a loss in itself. Flags, symbols of culture and identity, have proven intractable enough to require a process all of their own. The very intractability of the issue suggests that further work needs done and, in the meantime, we exist in the quagmire of competition for the acceptance of diverse identities and diverse needs to declare them. The lack of commitment to a way forward is a loss for it leaves us in the quagmire. Above all the lack of agreement on a way forward just leaves us hanging. No resolution will be fully acceptable to anyone. But at least a planned way forward lets people know where they are. Right now no one is sure where they are and that wilderness feeling pervades our lives and the old dynamics of dissension take hold, pulling us in different directions and away from the hope of a truly shared future in which diversity can be cherished. If the process is stalled then, in my view, there are losses for everyone. I am frustrated with the public debate. I am looking for something that won’t go over and over the same issues in ever decreasing circles of blame. These days I’m an ordinary, two-bit Presbyterian minister. I don’t convene any committees and I don’t sit on any boards. I’ve done my time and I know the difficulties. As an ordinary Presbyterian I want to hear what the churches have to say about the Haass & O’Sullivan talks. Actually I wanted to hear from the churches before we got to draft 7. I want to hear about Twaddell, Welfare Reform, education, food banks, employment, the future of healthcare provision, racist attacks. When I try to recall the voice of the churches in the public domain the predominant memories are of rampaging earnestness when it comes to sexuality or ‘gay’ blood. I want to hear about so much more. I want to know that my denomination and other denominations are struggling with what makes Talkback or Nolan or UTV Live. I want to hear a voice into the public debate, not necessarily offering answers but at least setting out issues and the difficulties in resolving them. As for the challenges, each denomination contains a cross-section of society. So to speak with one view is difficult. All the voices need to be recognised. And is that any different from a political party? All political parties are driven by their electorate which will, at least from time to time, have a variety of opinions. But churches aren’t political parties. Each church has to take account of the pastoral needs of its members and to represent those voices as best they can. But churches are also called to be, as I read the Bible, makers of peace, places where people pray for friend and enemy alike. Churches are tasked with seeking the peace of every City. Does that not make for some difference? Does it not mean that churches can speak with a voice that is both pastoral and energetic with vision? Or is it the case that these days churches are on their knees praying – Dear God, we have a problem? We do have a problem. It would be good to admit that at least. We have a problem with the diverse voices that make up our society and our denominations, voices that can’t harmonise for a way forward. We have a problem with diverse needs that cannot all be met. We have a problem with a public debate that prefers to take a pop at others and even sink into personal attack rather than unravel the issues. We have a problem in the lack of common will and purpose to address issues and find a way forward. We seem to have a problem with truth at more than one level, not just in relation to the past. Maybe, at best, we can truthfully say that we have a problem and we don’t quite know how to get through it. Could common purpose be found in the willingness to find a way through, to build peace with humility, compassion and sorrow for what we cannot do? Is that the most honest position to take? And if it is, can churches, denominations, at least say so? More worryingly, would it be more truthful to say that we don’t want to find a way through? We just have to live with what we’ve got.